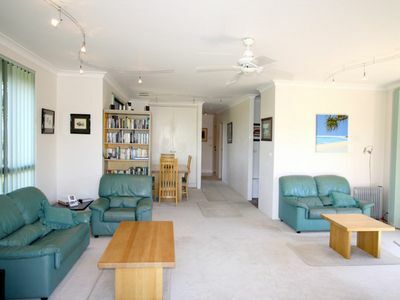 Three bedroom beach apartment in a great location, near major beaches and short walk into town. This three bedroom beach apartment enjoys morning sun and relaxing, tree-top level views in a dress-circle position adjacent to the Cape Byron Headland reserve. The unit is 100% Green Power. 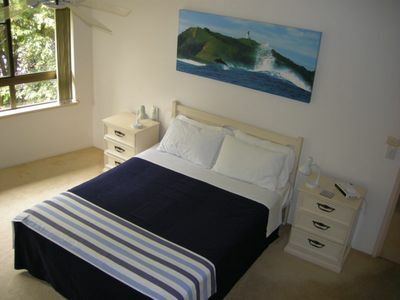 The main bedroom has queen bed with ensuite bathroom and television. 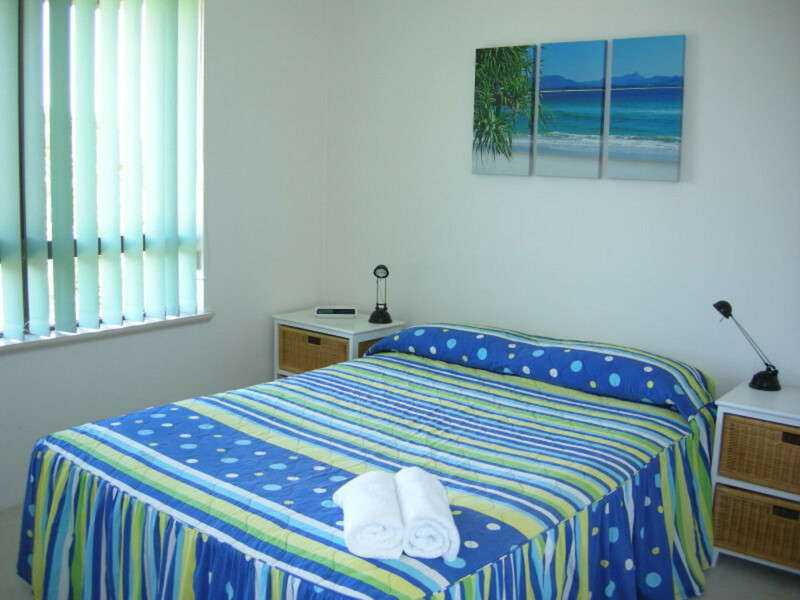 There are 2 more bedrooms with 1 queen bed and 2 single beds and main bathroom with combined laundry. Lounge, kitchen dining area are open & airy and lead to the rear balcony with webber BBQ, sun umbrella and table for eight. 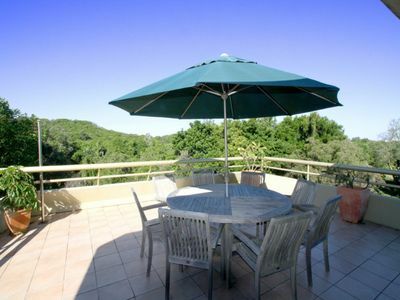 Great for BBQ’s and outdoor dining all day with tranquil surrounds. 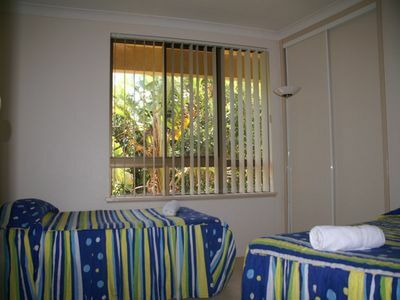 Bathrooms: Ensuite bathroom with shower, main bathroom with bath. Kitchen: Fully equipped kitchen with dishwasher and microwave. Laundry: Washing Machine, dryer, Iron and Ironing board supplied. 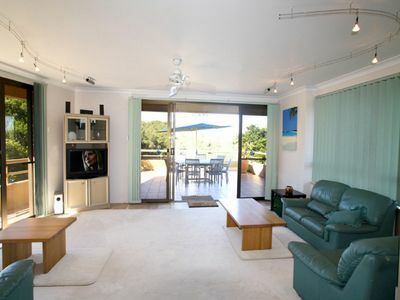 This shows “live” up to date availability for all holiday properties. Any time, 24 hours a day, 7 days a week, you may check availability and price. This includes bed linen (bed sheets, pillowslips, teatowel) and bath towels only. 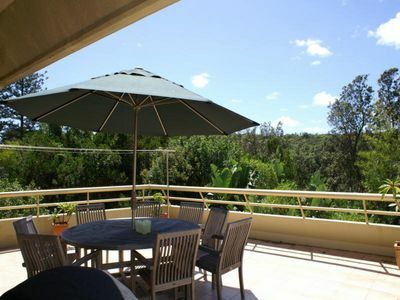 Please note that this property is fully self contained, however is not a serviced property. Servicing can be arranged during your stay at an extra charge. You will also need to bring all toiletries, basic food condiments and household items. Beach towels and hair dryers are not provided. 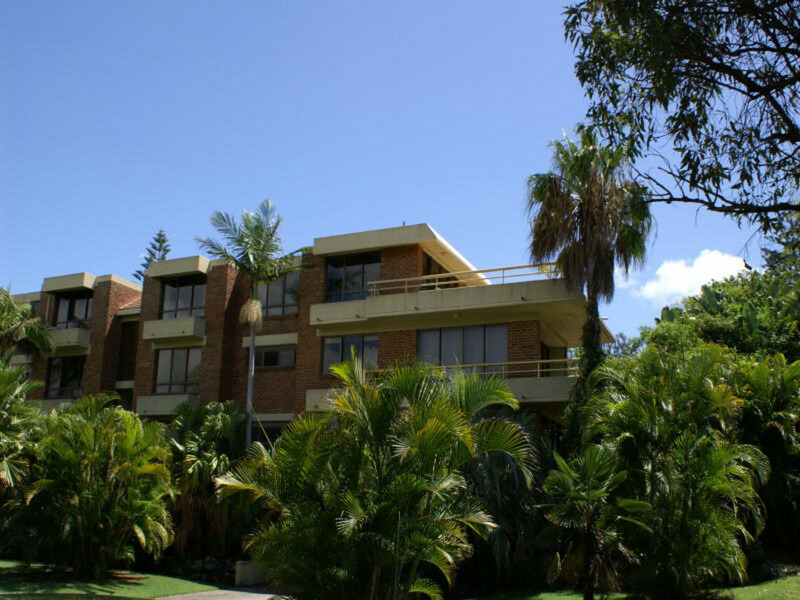 For additional items during your stay you may phone Byron Bay Holiday Hire 02 6685 6247 (extra linen, beach towels, cots, highchairs). You will be provided with an initial supply of toilet paper and dishwashing detergent. You will need to replenish this yourself.